Our clothes can be seen as a form of communication between ourselves and the outside world. They give a visual impression of who we are and how we would like to be seen by others. Pauchi Sasaki designs dresses which are not only visible, but transmit sonic material as well. 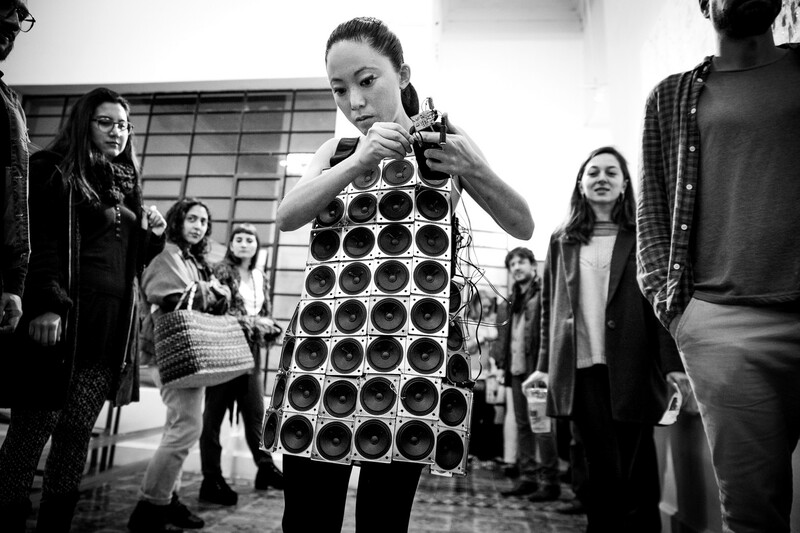 These dresses consist of around 100 loudspeakers and are able to process sound live. Pauchi got the idea for developing sonic costumes when she performed in a temple in Lima. As she remembers: “But of course, it’s an ancient temple, so there was no electricity or outlets; I could perform only acoustic sounds, even though that’s not what I had planned. That’s when I got the idea of a self-contained system, but one that could be integrated into my body, that was the idea” (interview by Michael Barron). 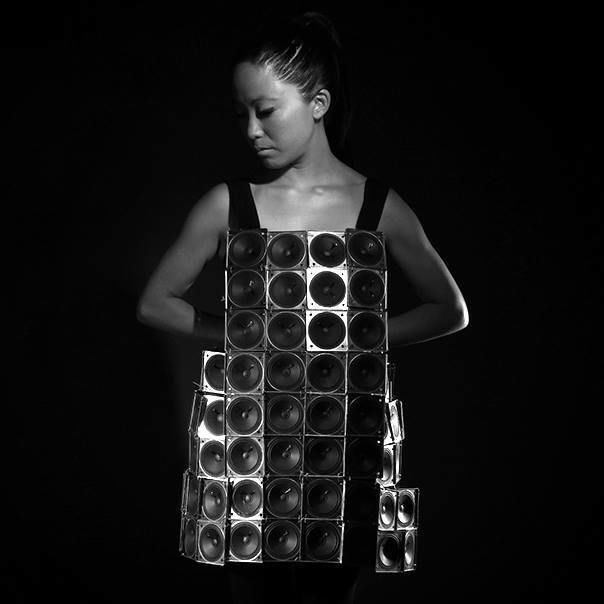 The result was developed in 2014 and is simply called Speaker Dress. It is a self designed wearable sound sculpture. Two dresses exist today, a black and a white one. The black one contains 96 loudspeakers; the white one, 125. 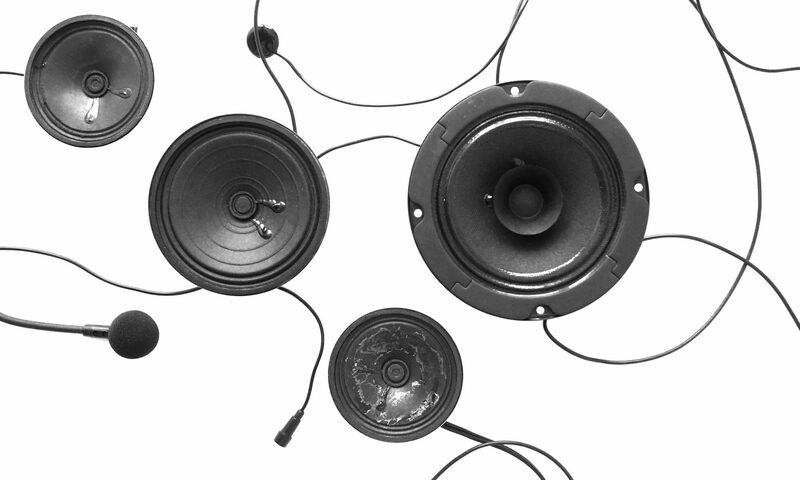 Several loudspeakers are connected to the same amplifier channel. The black dress, for example, contains six channels of amplification, resulting in 16 loudspeakers per channel, and in six different sonic zones on the dress (a zone is formed by the loudspeakers diffusing the same sound). The performer can choose from different input possibilities: a contact microphone, a lavalier microphone and an mp3 player are connected. These signals are sent wirelessly to a computer, which processes the sound with the music software Max. The sound is sent back to the dress again and is diffused by the loudspeakers. I am happy for you that you did!